Super Bowl Sunday is coming and you know what that means: Coca-Cola (KO) polar bears will be hamming it up, the E*TRADE (ETFC) Baby will charm viewers, and Audi's new LED headlights are going to do in some vampires. Ferris Bueller will even make a surprising return. Yes, the New England Patriots and New York Giants will interrupt the entertainment to run some football plays, but everyone knows that the Super Bowl is really all about the commercials. With advertisers spending a record average of $3.5 million this year for 30 seconds of pitch time, sponsors certainly seem to think that they'll be getting their money's worth. But will their shareholders feel the same way? Gauging a market campaign's Super Bowl spot relative to its share price isn't as easy as it sounds. Some advertisers -- including LivingSocial and Teleflora last year -- aren't public. Some products are also part of much larger companies. A clever Doritos ad isn't going to be seen as a major score for its parent company, PepsiCo (PEP). However, let's go over a few of the memorable ads from last year's Super Bowl game that are pure plays on publicly traded companies. Best Buy (BBY) had the genius star-studded pairing of rock legend Ozzy Osbourne with teen idol Justin Bieber in a spot for its then-new buyback protection program. The ad may have been clever, but the market was still left wondering why it would need to pay more for a product for the sake of the restrictive obsolescence insurance that the consumer electronics retailer was providing. The stock fell 0.7% on the Monday after the Super Bowl, and tumbled 4.6% over the course of the week. Things haven't gotten any better for Best Buy, now off 26% since last year's Super Bowl commercial. 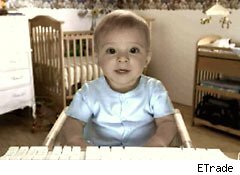 The E*TRADE Baby came back, this time with his tailor. The discount broker's ad showed how easy it was to get a novice investor up to speed in building an impressive portfolio. Sadly, the same thing can't be said of E*TRADE's stock itself over the long haul. The stock did pop 2.2% higher on the Monday after the ad aired -- and 4.2% on the week -- but it has gone on to shed more than half of its value. PepsiCo had several ads for both Pepsi MAX and Doritos. Those didn't seem to move the stock at all. The soda-and-salty-snacks giant saw its shares slip 0.2% on Super Bowl Monday, closing flat on the week. However, unlike Best Buy and E*TRADE, PepsiCo is actually trading higher these days -- up by 6%. And then there's salesforce.com (CRM), which spent a lot of money promoting Chatter during last year's Super Bowl. And today, how many people know that Chatter is a cloud-based company communications platform? The answer shows that Super Bowl ads may not even influence consumers, let alone the stock price. For an even longer view of post-game stock performance we can rewind even further -- past last year's ads and into Super Bowl commercial highlights of yore. Apple's (AAPL) 1984 ad -- the futuristic commercial directed by Ridley Scott -- made its national debut during the third quarter of Super Bowl XVIII in 1984. If you were fortunate enough to have bought Apple that year -- and held on through the company's rocky 1990s -- you'd be sitting on a 100-bagger today. However, we can also look to all of the Super Bowl ads by cash-rich and profit-poor dot-coms ahead of the Internet bubble that popped. The doomed Pets.com had a Super Bowl ad in 2000. Yahoo! (YHOO) gave television's costliest stage a swing with its talking dolphin ad in 2002. There's a surprising end to that one, though: Yahoo! shares have actually more than doubled since that time on a split-adjusted basis. But memorable ads will only get you so far. Anheuser-Busch (BUD) has had some of the game's most notable ads. (Everyone remembers the Bud-weis-er frogs, the "Whassup?" guys, and classy Clydesdale horse clips.) And, yes, the company has definitely been a quality investment over the years across several incarnations. Even so, earlier this month, Coors Light overtook Budweiser as the country's second-most-popular beer by volume. And while Anheuser-Busch can take heart in knowing that its Bud Light is still the top dog in beer consumption, it still must ask: Were all those frogs talking for naught? So do Super Bowl ads ultimately influence a stock's price? No, if all you do is spend $3.5 billion for an ad this weekend. If the product or service you're promoting will move the needle for your company, well, that's something else entirely. Longtime Motley Fool contributor Rick Munarriz does not own shares in any of the stocks in this article. The Motley Fool owns shares of Apple, Coca-Cola, Yahoo!, PepsiCo, and Best Buy. Motley Fool newsletter services have recommended buying shares of salesforce.com, Coca-Cola, Yahoo!, PepsiCo, and Apple. Motley Fool newsletter services have also recommended writing covered calls in Best Buy, creating a bull call spread position in Apple, creating a diagonal call position in PepsiCo, and shorting salesforce.com.